Don’t get hung up on fluctuating results in your search rankings. There are many causes for this. While Google’s biggest algorithm and platform changes (the most recent of which include Hummingbird, Penguin, and Panda) hit the headlines just a few times each year, in reality, their search engine algorithm is changing constantly. Google revealed that they made 516 changes in 2010. And (according to all available evidence) that pace has continued over the last four years. It’s no wonder then that the search engine results for your website can fluctuate so dramatically. If your search engine results are fluctuating widely, you should first determine whether just your site is affected, or whether the web as a whole has been hit. The most creative of all the online monitoring tools, MozCast uses a zany weather report to highlight Google’s algorithm changes. The hotter or stormier the outlook, the more pronounced and more widespread the algorithm changes. 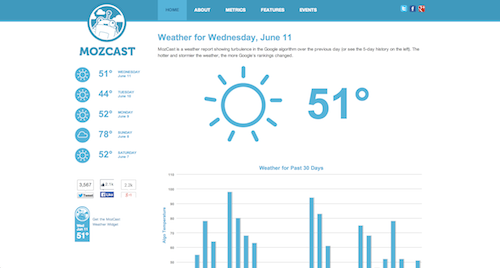 MozCast displays the weather for the last 30 days. Designed by Dejan SEO, Algoroo tracks Google’s algorithm changes by observing turbulence levels for the rankings of hundreds upon hundreds of keywords. Using a simple, easy-to-read bar graph, the higher the bar, the more likely it is that Google has implemented algorithm changes. Users can view results for the previous eighteen months. 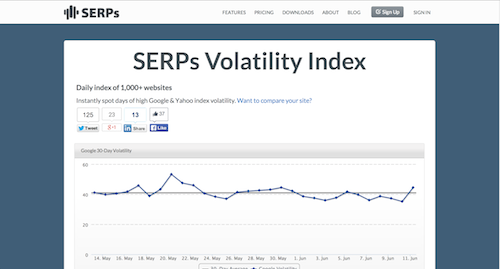 This particular online tool not only displays Google algorithm fluctuations, but changes to Bing and Yahoo! as well. 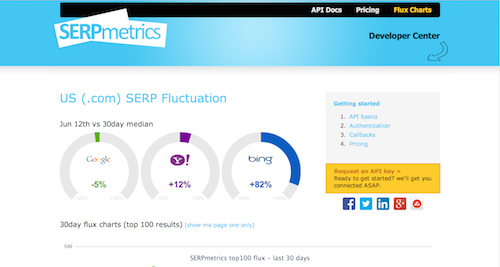 SERPMetrics collects data from the top 100 keyword results for the preceding 30 days. The tool also provides an option to display additional results from more than just the top 100 keywords. This is a daily index of 1,000 websites which demonstrates the volatility of Google search engine results over both 30 and 90 day periods. Unlike some of the other online tools, this one has a handy additional feature; you can compare your website to the top 1,000 websites. 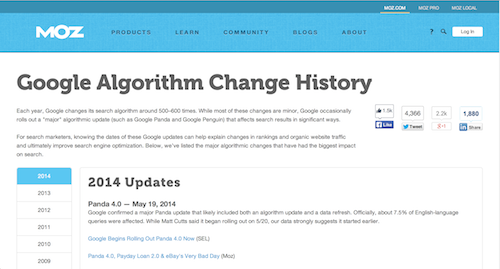 Another handy reference is Moz’s Google Algorithm Change History (http://moz.com/google-algorithm-change), which includes data all the way back to the year 2000. Being aware of the dates of Google’s major updates can go a long way in helping to explain ranking changes and fluctuations in organic website traffic. 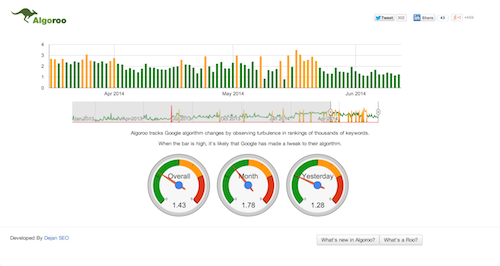 Ultimately, all this data goes a long way in helping to improve search engine optimisation. Rank monitoring isn’t what is used to be. Factors such as location, device and personalisation are playing an ever-increasing role in what type of results are returned when a Google search is performed. Google is getting smarter. For instance, if you search for The Stones, Google is now intuitive enough to determine (taking into account things like the intent of your search, search history, cookies and social connections) whether you are actually searching for The Rolling Stones or gem stones. Pretty neat, huh? Now that you’re familiar with the tools, go forth and monitor!